For anyone who fails to see that a Higher Power is speaking to the USA, perhaps now is the time to take a close look at some “OMENs in America” which have occurred since the beginning of the New Millennium. Just because biblical prophets in the style of an Isaiah or Elijah are no longer around to interpret the omens, does not mean that signs and wonders are not happening all about us. As a matter of fact, omens and prophetic signs are occurring in such numbers and with such frequency that it is difficult to keep up with them. In order to pierce through the pervasive cynicism and hard-wired skepticism which has enveloped the modern mind, we only have to point to the most prophetic event of this 3rd Millennium. Clearly, 9/11 has proven to be an event with the most wide-ranging repercussions since WWII; it’s also the most consequential the planet has seen since then. See how this single day’s acts of state-sponsored terrorism (false flag operation perpetrated by the World Shadow Government) changed the world in ways so profound and fundamental. As it continues to trigger major moves on the global geo-political chessboard, as well as alter the very fabric of American society. Clearly, the “land of the free, home of the brave” has morphed into an Orwellian landscape with dystopian features coming into sharper relief by the day. 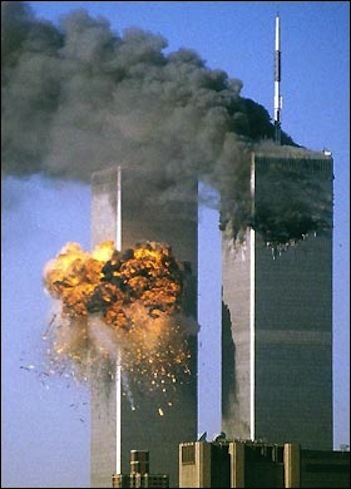 So much of what we see today, and especially what we don’t see, was cooked up as a prelude to, during and after 9/11. Truly, it has become the defining event of the 21st century. Whenever an event has such deep political, economic and social impact on an entire nation, especially one that will see to it that the whole world will be significantly affected, we call that an OMEN. How could it not be given the catastrophic nature and far-reaching ramifications of this attack on America? For those who need further evidence as to the enormity and gravity of exactly what has taken shape throughout the land in the wake of 9/11, consider the following analogy to J.R.R. Tolkien’s LORD OF THE RINGS. This trilogy stands as the preeminent prophetic work of the post World War II era. It possesses references to the most earth-shattering events and world-catalyzing phenomena, which we see in the major developments of the ‘civilized’ world over the past century. 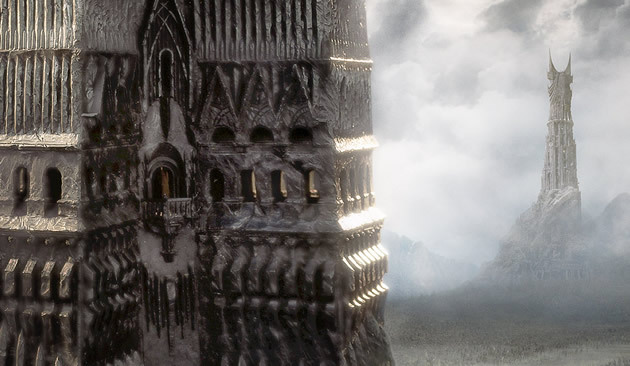 If you’re unable to perceive the connections between 9/11 and some of the essential elements of LORD OF THE RINGS, then consider Tolkien’s “The Two Towers” in an entirely different light. Just like the Ring of Power, the symbolism has many layers of meaning that are pregnant with both personal and global significance for every inhabitant of Planet Earth. So weighty are the portents in this trilogy, that we ignore them at great peril. The Universe has spoken loudly to humanity through the 9/11 event; avoiding individual or collective responsibility has now placed the entire civilization in jeopardy. In the case of Washington DC, the Ring of Power is known as the Pentagon whose very shape was conceived and designed to hold and project power into the world. This impregnable edifice was thought to be immune to attack, even to those from within. However, when omens are meant to occur, as they were on that fateful day of September 11th, 2001, it makes no difference regarding the message of the omen that the nation’s own leaders pushed the buttons. When the very heart of the US Military’s command and control center is pierced by a missile, shutting down the nation’s capital and airspace for a week, and paralyzing commerce throughout the Land of Opportunity, we think the Universe is telling us something. That a particular side of the Pentagon was destroyed with all of its evidence of financial wrongdoing is also quite noteworthy. No doubt that the feng shui was not favorable … on that day or any other. Nevertheless, the US Ring of Power has been shown not be be invincible. As a matter of fact, it is now revealed to be every bit as vulnerable to forces great and unknown, as every other manmade structure in creation. 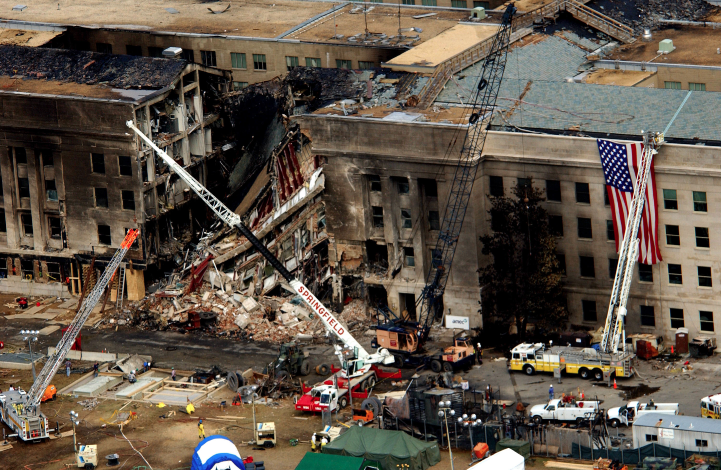 As the photo indicates, American Airlines Flight 77 never flew into the Pentagon. The impact hole is simply too small for a Boeing 757!? On Tuesday, August 23 of 2011 “the 2011 Virginia earthquake occurred on at 1:51 pm EDT (17:51 UTC) in the Piedmont region of the US state of Virginia. The epicenter, in Louisa County, was 38 mi (61 km) northwest of Richmond and 5 mi (8 km) south-southwest of the town of Mineral. It was an intraplate earthquake with a magnitude of 5.8 and a maximum perceived intensity of VII (very strong) on the Mercalli intensity scale. Several aftershocks, ranging up to 4.5 Mw in magnitude, occurred after the main tremor.” This earthquake “is the largest to have occurred in the U.S. east of the Rocky Mountains since a quake centered in Giles County in western Virginia occurred in 1897”. So powerful was this earthquake that two very significant national structures were severely damaged. Although we read and see very little about the destruction to these national landmarks in the mainstream media, the Washington Monument remains closed to this very day and the Washington National Cathedral will be undergoing reconstructive surgery for years to come. 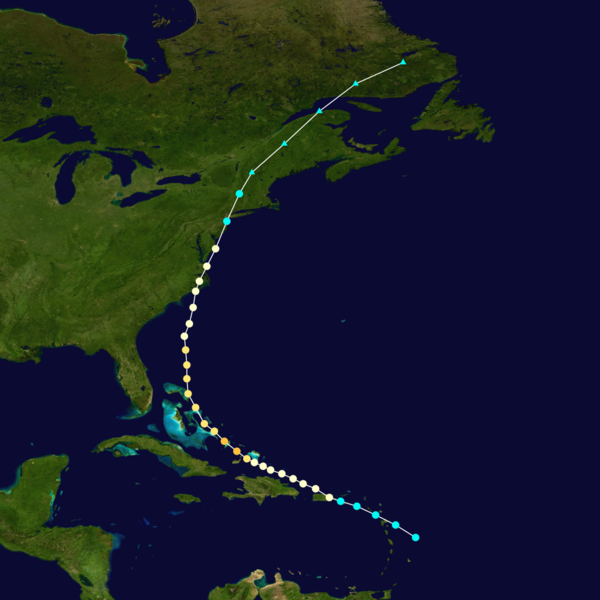 Just a few days after the Virginia earthquake, Hurricane Irene blew through the very same geographic area as the first named hurricane of the season. 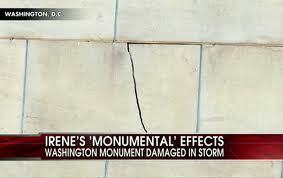 This storm hit the Washington DC area so hard that it revealed just how serious the cracks in the Washington Monument really were. 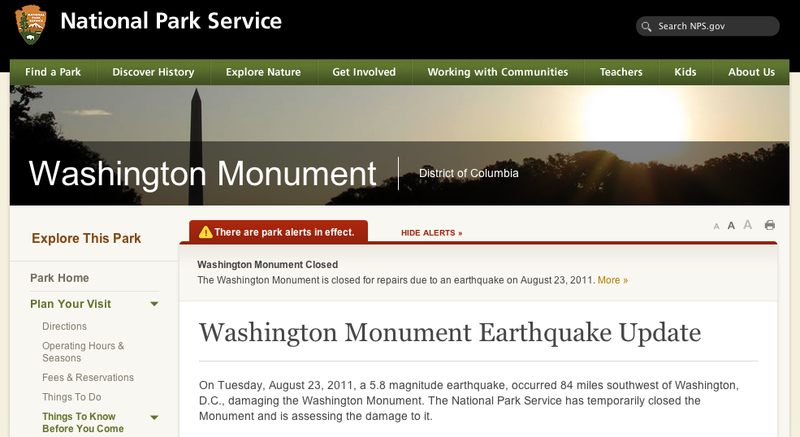 Here’s an update straight from the US National Park Service. What’s the point of this OMEN? When an earthquake and hurricane tag team jolts the nation’s capital in the same week, which inflicts unprecedented damage to the most symbolic national structures, perhaps there is a message, yes? Incidentally, the driving rains from Irene were so strong that they made sure that every crack and crevice caused by the recent earthquake would should up in a quite dramatic way. Kind of like Mother Earth saying that she could have destroyed the whole stone edifice with one momentary quake, but instead left those in charge with an unfixable ‘monolith’ which can no longer function (read transmit) as it was designed. Being the world’s tallest stone monument, this obelisk was quite deliberately positioned in a specific direction and at a specific distance from the White House and the Capitol building. It is first and foremost a power structure of the first order and was designed to draw down and focus certain types of energies which have supported the dominant role that the USA has played in the world. Who would disagree that this nation has assumed a very unique position of worldwide ascendancy, across many spheres of life, especially given its relatively short history. Every freemason knows that when the architecture has shifted or the foundation is cracked, the end is near. Especially when that architecture happens to be located in the capital city of the most powerful country on earth. The pre-eminent monuments and structures of every nation hold great meaning and power for their citizens. When they are damaged or destroyed, invariably the body politic suffers a wound which must be looked at and seriously contemplated. Just as the US missile attack on the Pentagon and the controlled demolition of the WTC Twin Towers have forced many of us to do for the past 11 years, particularly those who reside in the greater Washington, DC and New York City areas. There are many other connections and coincidences surrounding this 2011 tandem event brought to us by Mother Nature herself that are well beyond the scope of this essay. However, in light of the destruction at the Pentagon just 10 years earlier, it is now clear that ‘someone’ is trying to give an urgent message to DC, don’t you think? 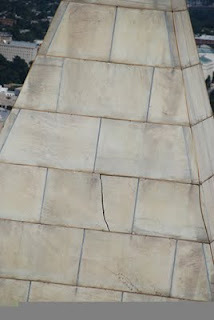 Multiple cracks can be seen in the middle of the Washington Monument. Here’s the recent headline of the Derecho which has caused many to continue to be out of power. Can you believe a 700 mile long storm front, that blew like a mini-hurricane or maxi-tornado, traveled all the way from Chicago to Washington DC? Aren’t these two cities now connected at the hip, especially with a sitting president hailing from the state of Illinois? Chicago is probably the most controlled city in America after NYC and DC. It’s history of graft and corruption are legendary as are its many think tanks like the University of Chicago, which either influence or outright control policy (especially economic/financial) all the way to the top of American Government and beyond. When a storm is so powerful that it causes 3 million to lose power, especially when the locus of power outages is concentrated throughout the Washington DC, Virginia and Maryland area, something’s up. The very symbolism of losing power in an area like The Beltway is as poignant as it is profound. When the very heart of the nation’s political, military and judicial power center goes into cardiac arrest, especially through Independence Day week, someone is attempting to deliver some kind of message, don’t you think? Particularly significant is the timing of this event four days after a pair of decisions were issued by both the Supreme Court on the Affordable Care Act and the Congress concerning a momentous contempt citation against the US Attorney General. Both are pretty HUGE happenings when they occur in the midst of a tumultuous presidential election cycle. From Chicago to DC, the Derecho of 2012 made impact like none other in history. With this Derecho we saw an unparalleled windstorm blow all the way from the Windy City of Chicago to the city of Windbags known as DC. If that’s not an OMEN …. Where else do we want to go with this one? Everyone lost their power for a day or two or more, and many will be out for some time. That a freak weather event like a derecho occurred right in the middle of the longest and most intense heat wave throughout the very same region is all the more telling. No power just when you need it the most for air conditioning, refrigeration, medical and health reasons, etc. And there’s nothing you can do about it, until the repairs are made, or you decide to accept life off the grid for a stretch of an unknown period of time. Casual Observation: When powerful people, who live, work and play in one of the major planetary power centers of the world, have their power plays suddenly short circuited, change is in the offing. BIG TIME! Talk about Cosmic Convergence! Who could have written a script for this trilogy of manmade, earth and weather events which have captivated the national psyche like few before? All them taking place within such a short span of time graphically illustrates the quickening which is being experienced by so many during these interesting times. Of course, as always the $64,000 question remains: How will we respond to these and many of the other upcoming events which are poised to take this world of ours by storm? We have often made this inquiry in the interest of pricking the consciousness of those who are ready for some hard answers. All of those answers can be found within. Now is the time to go inside and ascertain the true meaning for each person … for each family … for each community, which will find themselves in similar situations to those delineated above. OMENs are truly there to protect us, help us and guide us on our journey through life. There is nothing foreboding about them when they alert us to what we ought to do to avert the most unsettling outcomes. Regardless of how we are affected in the moment, it is our abiding faith (and positive attitude) which will see us through the thick and the thin. Our commentary here is only meant to instill a newfound respect for what has fallen away for the modern man. Since the “prophets of old” have been replaced by the “profits of now”, the society has put itself in an extremely disadvantaged position. So much idle and distracting chatter has replaced traditional words of wisdom, that we all find ourselves in a bit of a fix. The planetary predicament has now become so formidable and difficult to resolve that it can only be remedied in one way, particularly for those who have already entered their own “end of the world” scenarios. Forbearance is not a very common word in the American lexicon. 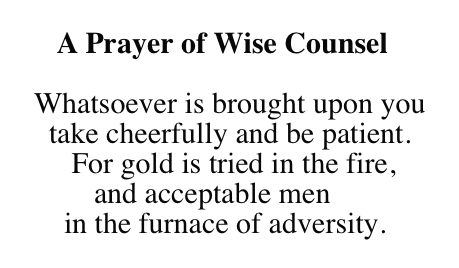 If you’re not familiar with it, now’s a good time to become acquainted with FORBEARANCE. 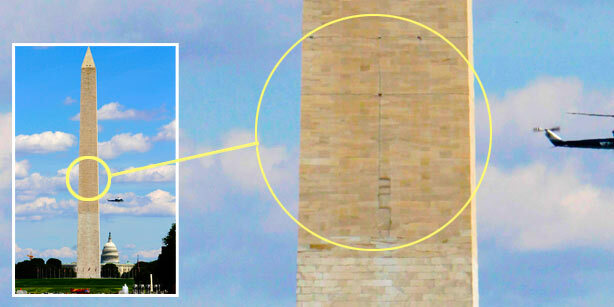 A four foot crack divides a center mason stone just below the capstone of the Washington Monument. Previous articleWho determined that the Mayan Calendar ends on December 21, 2012? Next articleAre The Markets HOPELESSLY Addicted to Deception? Many have written that omens which are manmade cannot be omens. They seem to think that this is especially the case when an evil deed is performed like the 9/11 false flag operation. We take a different view. We believe that the Highest Power can use anything, anytime, anywhere in such a way that it serves as an omen. Whether that sign or wonder is an earthquake … an eclipse of the sun … a nuclear detonation … or a HAARP-generated hurricane such as Katrina, each of these can serve as an omen. Regardless of what causes an omen event to occur, ultimately its source can be traced back to the Divine. The Divine can use any form of agency to bring about an omen; not just natural events or supernatural happenings. Why wouldn’t the Creator utilize the most effective way of delivering an urgent message to His needful children who are clearly on the wrong track?